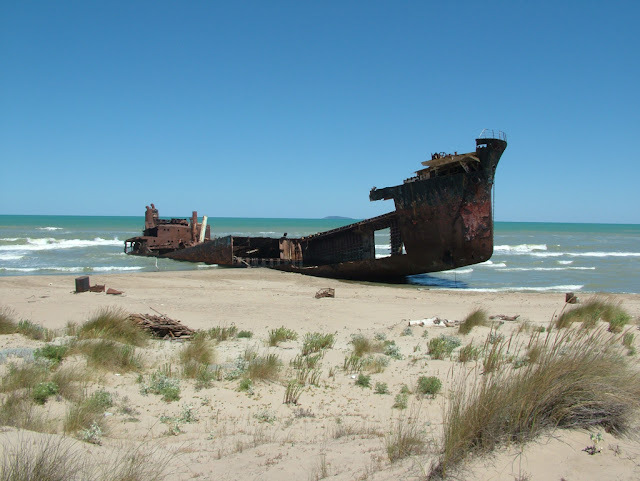 The amazing shipwreck of the Eden V. I unfortunately can't find much information on its story. It seems that someone started to scrap the ship as you can see the missing parts on the last pictures. 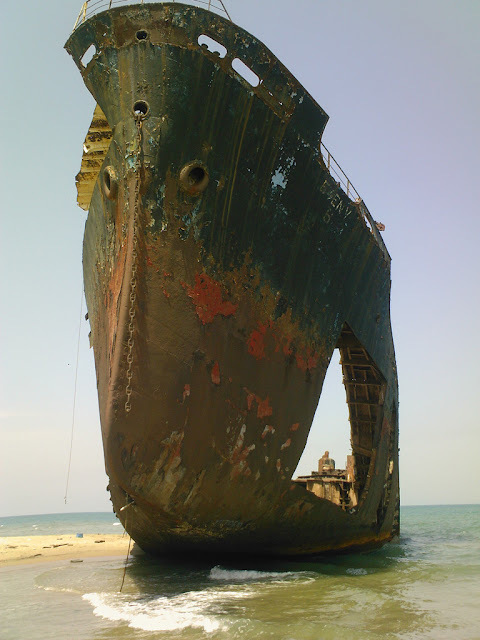 "Hi,i found some info of this ship on a local blog. 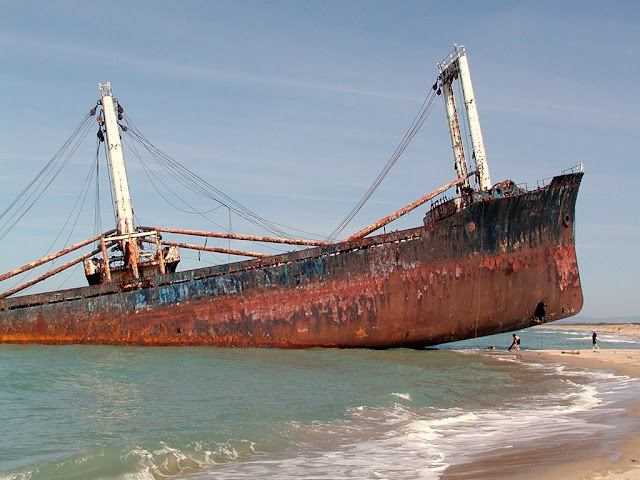 It seems that this ship created a lot of problems to inhabitants:no-one claimed the ship once it was stranded, and police found 2 tons of radioactive material. 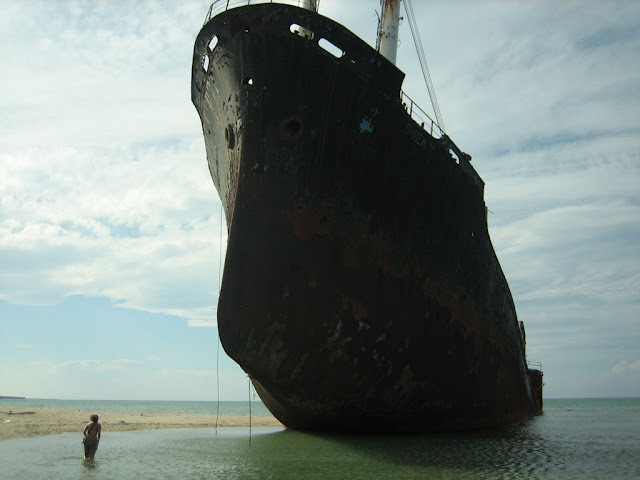 Notice that the ship wrecked into a protected area: the Gargano National Park. 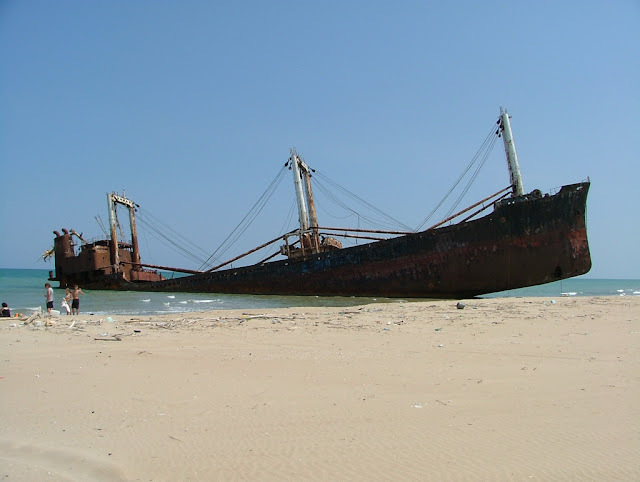 The ship wrecked in december 16th, 1988 in Contrada Morella(Lesina, FG) ,without any flag. Couldn't find the shipowner, nor the owner, because of the merchant ship was not registered in maltese registers as described in onboard register,resulted false. Ship was empty,or at least it seemed empty at first look. (...) London Lloyd's revealed that the ship had name: EtSuyoMaru, Pollux(1980), Mania(1983), Haris(1984), Hara(1985), Happiness(1986), Fame,LeskasSky,Kirlaki(all in 1987), Ocanido, Seawolf(1989). The last selling was in 1988 and the buyer was "Noura-Court-Apt105" of Limassol(Cyprus). At 16.25h of december 16th,1988, Colonel Ubaldo Scarpati, responsible of sipontina coast guard,was warned from aerial assistance center of Martina Franca. The commander of Eden V refused any assistance,saying that "he's not in danger and he will do personally the refloat". The commander, lebanese, Hamad Bedaran, before disappearing said to procurator Eugenio Villante that "the ship,coming from beirut,where discharged limber,was pointing to Ploce, Jugoslavia, to load Iron". BUT. Scarpati said that in the ship were other courses,and in particular the 285,that is from mediterranean sea to garganic coast. 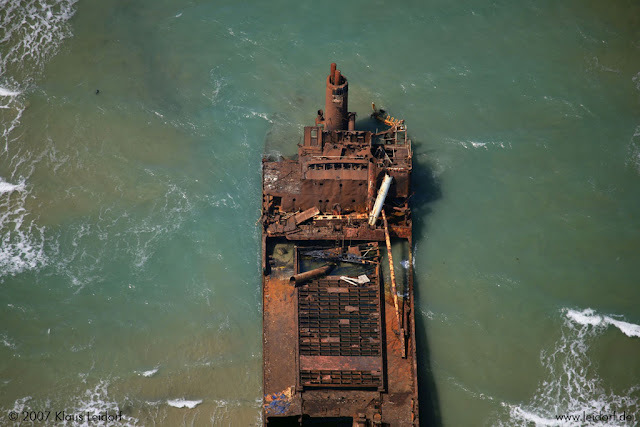 (...) Around the wreck ( 3,119 tons per 95m length),in a range of 3km, lie down about 123 rusty and smelling barrels , and maybe others under the sea and over the beach. Vigilantes of sanitary bureau of Foggia found in barrels 2 tons of radioactive material. "we found 1,700 becquerel per kilogram of substances, 16 over the risk limit for an human being, that is 100 becquerel", revealed prof. Domenico Palermo, director of chemical department of Zooprofilattic Department of Puglia and Basilicata. Can someone please save Italy from ignorance and uncaring attitude? Hi,i found some info of this ship on a local blog. Ship was launched in Japan,1969;the actual name was Eden V, but this is just the last camouflage. London Lloyd's revealed that the ship had name: EtSuyoMaru, Pollux(1980), Mania(1983), Haris(1984), Hara(1985), Happiness(1986), Fame,LeskasSky,Kirlaki(all in 1987), Ocanido, Seawolf(1989). The last selling was in 1988 and the buyer was "Noura-Court-Apt105" of Limassol(Cyprus). On December 21th, 1988 International Maritime Bureau, with a telex, communicated that classification documents of the Bureau are false and the ship was never registered to their registers". Around the wreck ( 3,119 tons per 95m length),in a range of 3km, lie down about 123 rusty and smelling barrels , and maybe others under the sea and over the beach. at December 05th, 2008 (20 years after) problem is still NOT SOLVED. Around the ship is present dirty beach, fuel and slurry.. Thank you Diego for all the information you provided. I will update the article accordingly. Also note that coordinate of the ship is provided (as for most of the places on this website) at the end of the article.